As we read on in A Christmas Carol, we learn a bit more about why Scrooge has no room in his heart for family. As a boy, he was sent away to a dreary boarding school by his unkind father. Scrooge’s sister, Fan, once visited her brother at school, bringing the good news that Ebenezer was coming home for Christmas because their father was “so much kinder than he used to be.” The boy was quite fond of his sister, who was physically delicate but strong in heart. She died as a young woman, after marrying and giving birth to Fred. Scrooge, it turns out, had once been engaged to be married. But his fiancée, seeing how Ebenezer had been changed for the worse by his love of money, broke off their engagement. Denied a happy family life while growing up, Scrooge’s greed denied him the blessings of family and left him a solitary, irritable man. The example of Scrooge reminds us that keeping Christmas well happens in families. For many of us, this idea is intuitive because our holiday traditions involve families reuniting. Perhaps my favorite part of Christmas is having my two children back home. Yet, if we’re to live in light of the coming of Christ not just during the holidays but all the time, then we will value family life throughout the year. This can be a difficult challenge if our work is demanding. But the birth of Jesus into a family encourages us to make time for our own families. But what about those who don’t have families nearby? How can they keep Christmas well with family? The biblical answer points to the Christian community, which is a family of brothers and sisters. As John points out in his first letter, “Whoever loves a brother or sister lives in the light” (1 John 2:10). Every one of them, whether married or single, whether close to or far from our natural families, is a member of God’s family. The more we allow Christ to live in our hearts, the more we will be drawn to share his love with our sisters and brothers, so that we might live in the light. When you think of family gatherings at Christmas, what comes to mind? Do you have happy memories? Sad memories? Why does being with family matter so much at Christmas time? Have you experienced the church as a family? When? How? Are there ways you might be more deeply engaged with your brothers and sisters in Christ? Heavenly Father, thank you for our families, and for the chance to be together in the season of Christmas. We pray for those who cannot be with their families at this time of year: people who cannot afford a trip home, those who have to work during this season, those serving overseas in the armed services, those who are alienated from their families. May they sense your presence and peace in a special way. And may they be welcomed into the family of your people. Thank you, Lord, for adopting us as your sons and daughters. Thank you for inviting us into your family. Thank you for the brothers and sisters we have in Christ. Help us to live as engaged members of your family, so that we might live in your light. Amen. 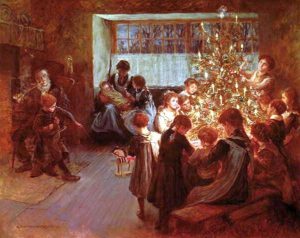 Image Credit: “Albert Chevallier Tayler – The Christmas Tree 1911” by Albert Chevallier Tayler – oil on canvas. Licensed under Public Domain via Wikimedia Commons.